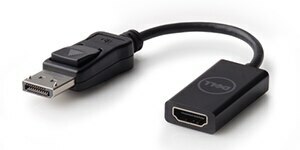 With the Dell Adapter - DisplayPort to HDMI 2.0 (4K) you can connect your PC's DisplayPort to 4K displays with an HDMI input without compromising on picture quality. Enjoy a seamless connection between PCs with DisplayPorts and with multiple versions of HDMI (versions 1.2, 1.4 and 2.0) -compliant monitors, projectors and HDTVs. The adapter supports up to Ultra HD (4K) at 60 Hz, so you can experience incredible screen clarity while viewing your favorite 4K videos, playing games or making presentations on a large display. The adapter works seamlessly between PCs with DisplayPorts and HDMI-compliant displays. Bring the adapter with you wherever your busy day takes you. Its compact and lightweight design makes it easy to carry around. Just throw it in your bag and head off to your next destination. With the added convenience of plug & play, you won't have to waste time trying to get your display set up. Simply connect the adapter from the DisplayPort on your PC to the HDMI input on your monitor, projector or HDTV, and get started right away. Get started right away with plug & play. 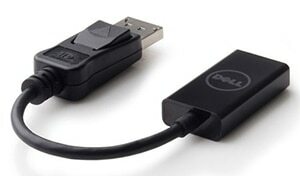 The compact Dell Adapter - USB 3.0 to HDMI/VGA/Ethernet/USB 2.0 DA100 offers a plug-and-play solution for connecting your laptop or notebook to an external display and other essential devices. It also features an Ethernet port, which means it can replace as many as three dongles to save you space on your desk and in your bag. Onboard USB 2.0 means you still have an open port to connect with USB peripherals. Ezytronic Sdn Bhd is a platform provide services to customers. Hence, we are Dell’s specialist on the laptop, desktop, server and storage range. We provided Enterprise IT solutions which include cloudbase solution, storage solution, virtualisation and infrastructure. No 45, Jalan USJ 21/10, USJ 21 , Subang Jaya, 47640, Selangor, Malaysia.